Ηandle of Rhodian commercial amphora bearing the stamp of Aristion. Mound of the Apadāna. Šuš (Susa), Khūzestān province, Iran. 198-190+ BC. Excavations of R. Ghirshman (Délégation archéologique en Iran), 1965. Place of conservation and dimensions unknown. According to Roman Ghirshman (1967: 406-408; idem 1968: 17, fig. 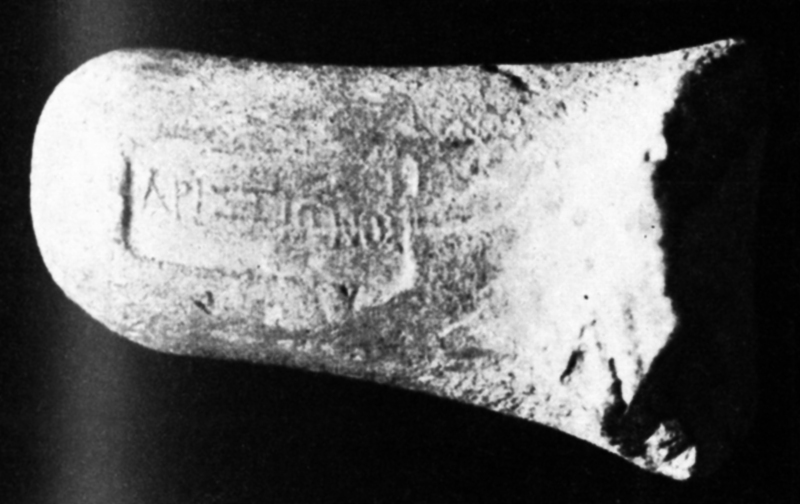 42; idem 1976: 200), the stamped handle was recovered from the fill of an ancient trench on the Mound of the Apadāna. It is one of a small number of stamped amphora handles known to date from Susa and Iran in general. As it emerges from the comprehensive study of the examples from Susa by Patrick Monsieur, Rémy Boucharlat and Ernie Haerinck, the seven datable pieces of this collection —including six from Rhodes— range from the final quarter of the third to the second quarter of the second century BC (Monsieur et al. 2011: 178-179, Table 2), thus offering concrete testimony about (maritime) commercial exchanges between Iran and the Mediterranean during that time. (For the wider distribution of Rhodian amphorae finds around the Persian Gulf in hellenistic times, see, e.g., Monsieur et al. 2013). The chronological estimate of 198-190+ BC for the present example derives from other amphorae by the same manufacturer, Aristion, from elsewhere that bear stamps of the Rhodian eponyms Dorcylidas (ca. 198 BC), Cleitomachus (ca. 193 BC) and Damothemis (ca. 191 BC) (Monsieur et al. 2011: 167, 174-175, based on Jöhrens 1999: 38-39 no. 88). Ghirshman, R. 1967. 'Suse au IIIe millénaire avant notre ère.' Comptes rendus des séances de l'Académie des Inscriptions et Belles-Lettres 111: 402-410. ——. 1968. 'Suse au tournant du IIIe au IIe millénaire avant notre ère’, with a contribution by J. A. Brinkman. Arts asiatiques 17: 3-44. ——. 1976. Terrasses sacrées de Bard-è Néchandeh et Masjid-i-Soleiman, vol. I. Mémoires de la Délégation archéologique en Iran XLV. Paris. Jöhrens, G. 1999. Amphorenstempel im Nationalmuseum von Athen. Zu den von H.G. Lolling aufgenommenen “unedierten Henkelinschriften". Mit einem Anhang: Die Amphorenstempel in der Sammlung der Abteilung Athen des Deutschen Archäologischen Instituts. Mainz. Monsieur, P., Boucharlat, R. and Haerinck, E. 2011. 'Amphores grecques timbrées découvertes à Suse (SO-Iran).' Iranica antiqua 46: 161-192. Monsieur, P., Overlaet, B., Jasim, S. A., Yousif, E. and Haerinck, E. 2013. 'Rhodian amphora stamps found in Mleiha (Sharjah, UAE): old and recent finds.' Arabian Archaeology and Epigraphy 24: 208–223. The research project ‘Mapping Ancient Cultural Encounters: Greeks in Iran ca. 550 BC – ca. AD 650’ is hosted by the Institute of Historical Research (IHR), National Hellenic Research Foundation (NHRF), Athens, Greece. Partial support for research conducted in 2014-2015 was provided by the Project ‘Kyrtou plegmata’ of IHR/NHRF, Action KREPIS of the Hellenic General Secretariat for Research and Technology. Terms and Conditions of Use.